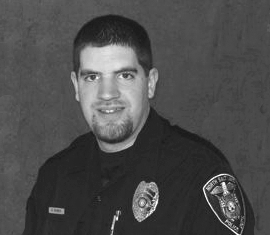 Officer Skinner died of injuries suffered while responding to a call for assistance from another agency pursuing a stolen car. The pursuit began in Bountiful in the early morning hours of November 3. At 2300 S. Highway 89, the 30-year-old victim lost control of his patrol vehicle on a rain-slick road. The vehicle collided with the concrete base of a business sign. Officer Skinner was flown to a hospital with severe head injuries. He died five days later. Officer Skinner was married and the father of three-week-old twins. He is buried in Bountiful City Cemetery. His bronze name plaque is sponsored by the North Salt Lake Police Department. To the family of Officer Skinner. May God always shine on you through your grief and loss. We love you very much and you are in our thoughts every minute of every day. Life will never be the same without you the memories we have of you are what get us through our days. I just Indexed your obituary. As you witness from Heaven what is going on lately I cannot be more grateful for persons such as yourself and your comrades in uniform who protect this citizenry. Of course mistakes are made. We are humans after all. But there are those of us who are constantly in awe of what you all do for us. Who else would willingly pursue a stolen car during inclement weather? Who puts their lives on the line responding to “unknown problems” or person with a gun? And the spouses and families of these same wonderful people … the sacrifices they make. I add my prayers to the many that have been offered on behalf of your wife, twins, and families. Thank you Officer Charles B Skinner!